Update iChat or Adium status picture with iSight pic every 30 seconds. Is there a better alternative to DuckCall? Is DuckCall really the best app in Chat category? 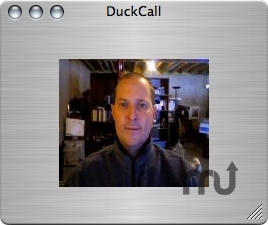 Will DuckCall work good on macOS 10.13.4? DuckCall is a trivial little utility that I wrote once I realised that I was getting a MacBook Pro, and it had a camera built into it. It updates your iChat or Adium (requires one of the 1.0 betas) status picture with a shot taken from the iSight evey 30 seconds. It's very crude, and consists of a PyObjC wrapper round a stand-alone binary (to get the picture from the iSight) and a bunch of AppleScript (to set the picture into iChat / Adium) - there's no reason for it to be written in Python at all, and it's far too large as a result, but PyObjC is my 'crazy prototyping' environment of choice. Version 0.0.3: Works on Leopard. And Leopard only. But it's much much smaller. Mac OS X 10.5 or later, iSight. DuckCall needs a rating. Be the first to rate this app and get the discussion started!